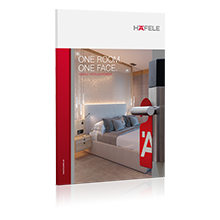 Häfele, the worldwide leading hardware specialist for furniture fittings, architectural hardware, lighting and electronic access control, and Interel, the leading solution provider for integrated guestroom control and energy management systems for the hospitality industry, today announce the integration of Häfele’s Dialock electronic locking system with Interel’s guest room management solution in a world’s first for the hospitality industry. 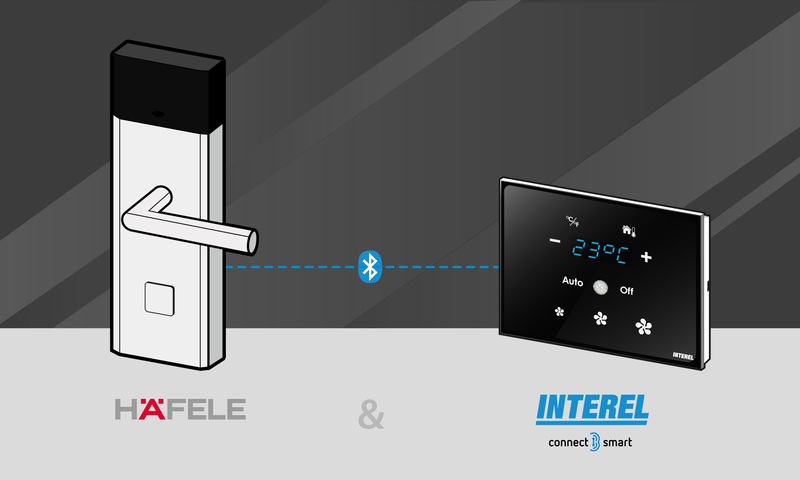 Utilizing Interel’s connectBsmart Bluetooth Low Energy IoT infrastructure, which is part of every Interel Guest Room and Energy Management solution, the Häfele Dialock door lock is able to exchange information with the Dialock server in complete end to end security, tunnelling data from the lock to the server. 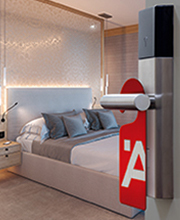 This is enabled by Interel’s proprietary protocol, allowing the door lock to communicate efficiently into the network over Bluetooth Low Energy, a world’s first for the hospitality industry. This permits hotel operators to reap all benefits of an online door lock system, such as remote battery monitoring and room change functions, while building on the lock’s built in Bluetooth capability, which is already in use for Smartphone Key in many properties. This negates the need to purchase and manage a separate dedicated network and its hardware components for the lock system, resulting in significant cost savings both during installation and ongoing maintenance. In addition, the two systems are able to exchange relevant information about the interaction on either system with each other, facilitating advanced energy savings and improved guest experience. For instance, the Häfele Dialock lock reports opening or closing events of the door to the Interel Guest Room Management solution, helping to determine if a guest is present in the room or not and accordingly engage energy saving modes, such as reducing the heating or cooling and turning off unneeded lights. Another example is the ability to provide a temporary conditional access for certain hotel staff roles, depending on the Do Not Disturb status on the room management system, therefore ensuring true privacy even without the use of the manual deadbolt. 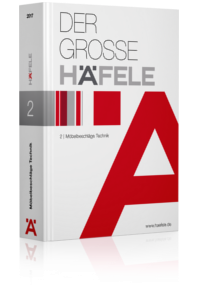 “We’re excited to welcome Häfele as a new partner to the connectBsmart ecosystem and become part of our Hotel of Things TM strategy. This integration proves how efficiently integrated hotel technologies generate savings for our customers not only in OPEX but also CAPEX. We continue to focus on innovating in areas that improve sustainability, operational efficiency and guest experience. 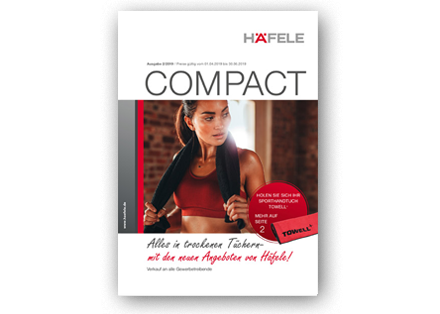 The integration with Häfele’s Dialock system ticks all these boxes and is a testament to our commitment to provide our customers more value by enabling them to leverage our intelligent infrastructure”, commented Florian Gallini, Interel Group CEO. 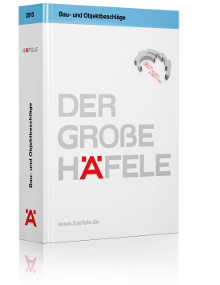 “The secure connection of the Interel guestroom control system means that Häfele is once again extending not just the functional scope of its Dialock electronic access control system, but is already reliably creating interfaces that are becoming increasingly important in the digitalised hotel business. It is not just the simple presence of functioning components that creates satisfied customers, but perfect interaction during continuous operation on site. As a complete solution provider for the hotel industry, Häfele is providing both budget reliability and functional reliability, which are a huge benefit to investors, planners and operators and for the good of the guest”, says Sibylle Thierer, CEO of Häfele GmbH & Co KG.